When we travel between our summer home in Minnesota and our winter home in Arizona, we always stop at the homey Kumback Lunch in Perry, Oklahoma. 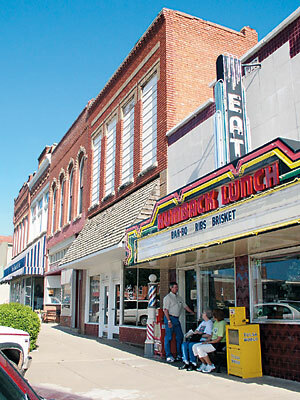 Established in 1926 by a big-hearted soul named Eddie Parker, the Kumback is a fixture in this pretty prairie town, founded literally overnight during the famous 1893 Cherokee Strip land run. 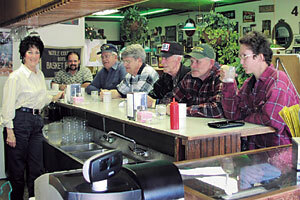 In fact, the Kumback, located on the north side of Perry's classic courthouse square, is one of the state's oldest cafes. The Kumback is as much a part of this community of 5,000 or so folks as the restored 1915 Noble County Courthouse across the street (it's listed on the National Register of Historic Places). Eddie endeared himself to locals by serving free meals to those in need; after World War II, he gave away 200 steak dinners to soldiers returning home! Over the years, we've learned that everyone from governors to gangsters have stopped here for a meal, including notorious bank robber Pretty Boy Floyd in the early 1930s. He walked in with a gun and told Eddie to tell all his customers to leave, then lock the door. Eddie was somewhat relieved when Floyd wanted nothing more than the biggest steak in the house. Today, Tony Macias, who once worked as Eddie's butcher and cook, and his wife, Marilee, carry on the Kumback tradition; they're only the second family to own the diner. They still serve home-style food, generously portioned and reasonably priced. Don't miss the famous cinnamon rolls, made from a 70-year-old family recipe. If the great food and friendly conversation don't make you feel at home, the nostalgic Route 66 decor will. Stop by soon; I guarantee you won't find a better meal or a friendlier place. Like the name implies, you'll definitely want to come back, just like we do! Perry is in north-central Oklahoma, where U.S. Highways 77 and 64 meet State Highway 86, about 2 miles east of I-35 (Exit 186) and approximately 60 miles north of Oklahoma City. To learn more about Perry call the Perry Chamber of Commerce at 1-580-336-4684. The Kumback Lunch (625 Delaware St.) is open from 5 a.m. to 8 p.m. Monday through Friday and 5:30 a.m. to 2 p.m. on Saturday; it's closed Sunday. For more information, call 1-580-336-4646.